Static Simulator by VI-grade is a professional solution that allows OEMs, Tier1 suppliers and Research Institutes to use driving simulator to start bridging the gap between physical testing and simulation. Our static simulator is based on the same VI-DriveSim software package that is used on Compact Simulator and on DiM, but is also fully compatible with 3rd party software solutions. This makes it possible to upgrade the static simulator to a dynamic simulator later on, leveraging previous investments. HMI, Vehicle Dynamics, NVH and ADAS are some of the disciplines that could be developed using a static simulator by VI-grade. 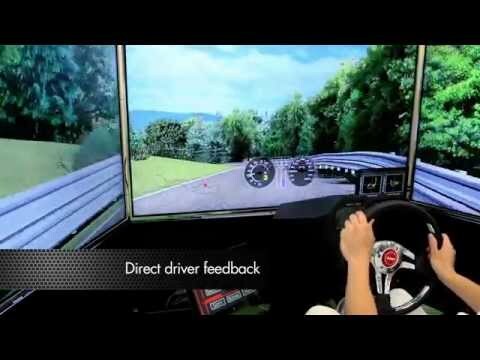 Cylindrical screen and professional projectors make it possible to reach very high level of realism and to give driver an immersive driver experience. Thanks to the real-time hardware infrastructure, static simulator is also suitable for software-in-the-loop and hardware-in-the-loop applications. Accessory technologies like VI-BioTelemetry, VI-ActiveSeat and VI-ActiveBelts are also fully compatible with Static Simulator.